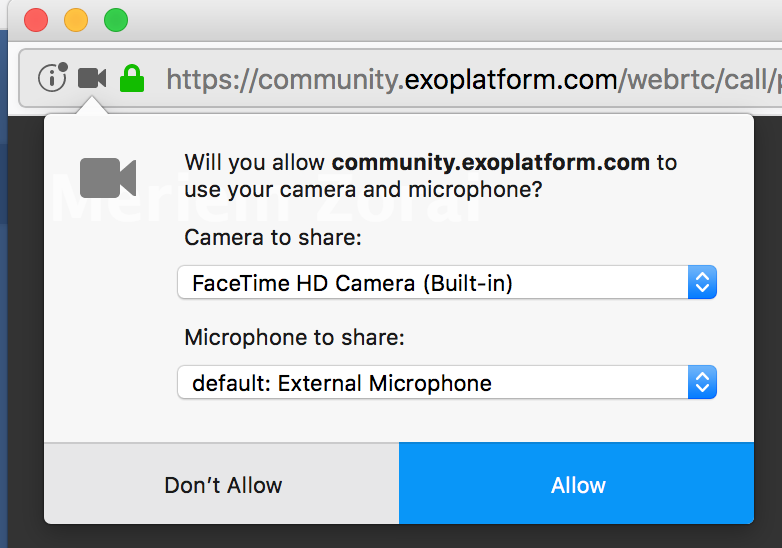 Users can make audio or video conference calls directly from eXo Platform’s web interface thanks to the eXo Web Conferencing add-on. It comes built-in with the Enterprise edition. As an administrator of the platform, it lets you manage and configure Web Conferencing via an administrative interface. Starting from the 5.0 version of eXo Platform it is possible to make one-to-one video calls through the Web Conferencing add-on. The video call functionality operates with the standard WebRTC and requires modern web browsers. Web Conferencing is not supported for the browser IE11. Check the full list of supported web browsers in this file. One-to-one video calls are not available for mobile devices. To use the Web Conferencing functionality and make video call with another user, you just need to click on the Call button . When moussing over a user’s avatar in the activity stream. When accessing a user’s profile, near the user’s display name. In mini chat room windows. Pressing the Call button emits a call and generates a separate browser window which displays your face if you activated your camera in your last call. It also emits ringtone, which indicates that an outgoing call is in progress. The ringtone stops when the callee answers the call. To process to the call, you need to click on the Allow button. Video sharing and microphone settings remember your previous status. For example, if you have muted your microphone in a previous session, the call starts with sound muted. If you have unshared your camera, the call starts without streaming your video stream. When starting the call i.e. after pressing the Call button, at first it shows your camera stream, and when communication is established with your partner, it displays their video stream (if they have enabled it). After that, your own video stream is miniaturised on the bottom-right corner. : This allows you to mute/unmute your audio. : This allows you to share/unshare your video stream. : This allows you to end the video call. Clicking on this button terminates the call and closes the call window. 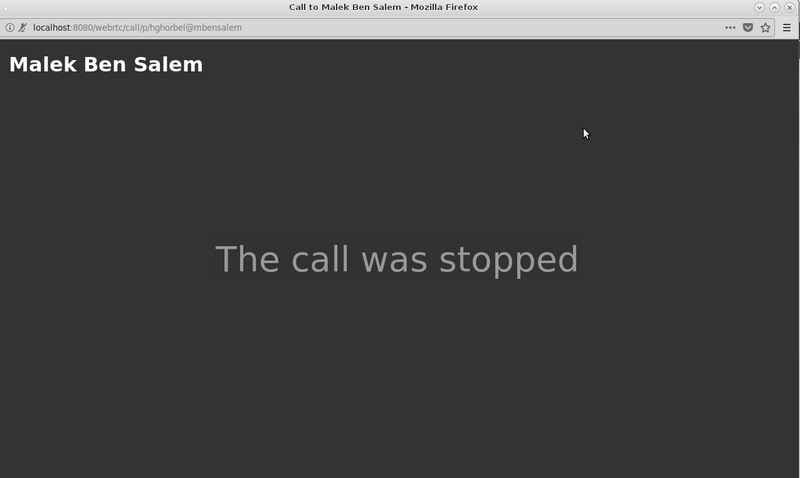 It is also possible to terminate the call by clicking on the Close button of the call screen’s web page. 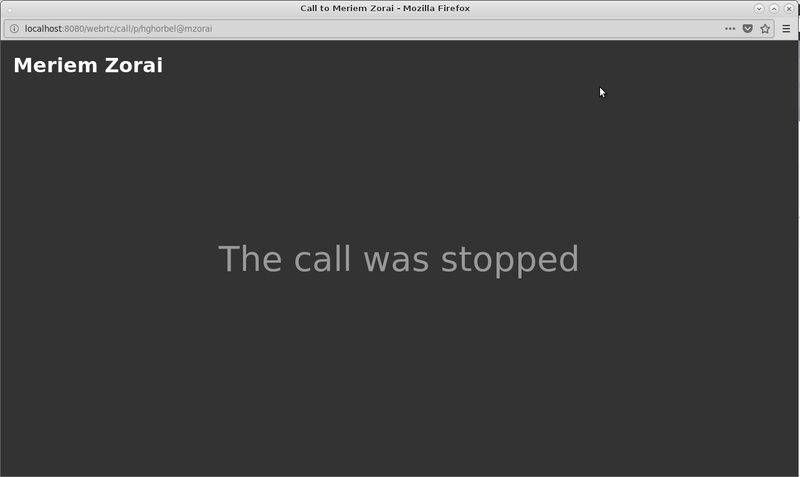 If your callee declines the call, a a hang-up sound is played on your local output and then the call window displays a message which indicates that the call has been stopped. 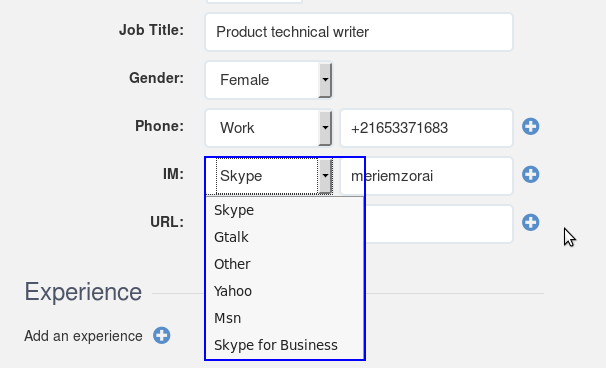 If many connectors are installed and enabled for Web Conferencing, the Call button will be a pulldown which allows to select which provider that you want to use. This pulldown remembers your last selected settings, and displays these by default. 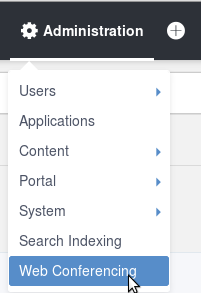 For each call provider who needs an IM account, a new entry is added in the IM-field pulldown of users’ profiles. When someone calls you and your chat status is “Available” or “Away”, you will hear a ringtone indicating an incoming call and you will also receive a notification window no matter which page of the PRODUCT portal you are on. 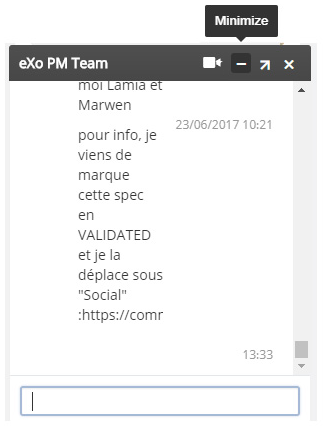 A message which states, “[the user’s display name]” is calling you, where the user’s display name is the full name of the caller. Two buttons, “Answer” and “Decline”. When you click on the Answer button, you accept the call and it opens the call window which displays your camera stream. While the connection is established, it also displays your caller’s camera stream and your own camera stream is miniaturised in the bottom-right corner. When you click on the Decline button, you refuse the call and it dismisses the incoming popover. Clicking on the Close button of the notification window allows you to also decline the call. The same stands for Placing a call, the camera and microphone settings remember previous status. The Web Conferencing add-on comes with an administrative interface which allows administrators to enable/disable providers and configure settings. 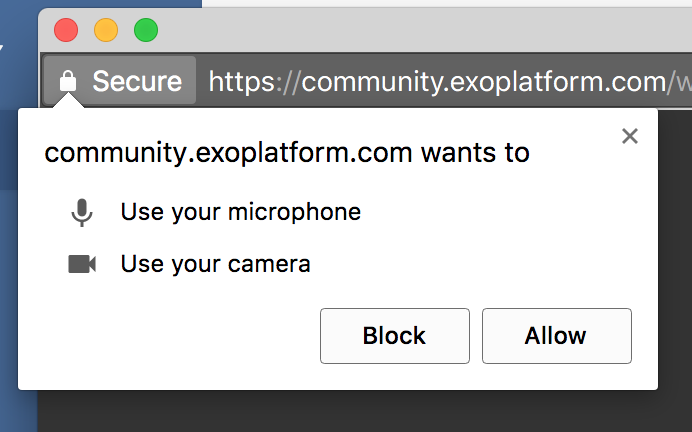 In the previous illustration, multiple providers are available, which is not the case in the standard Web Conferencing add-on that comes built-in with eXo Platform. In standard distributions, only WebRTC connector is available. Other providers will be available on different add-ons, but they are not supported. You should be part of the group platform/administrators. 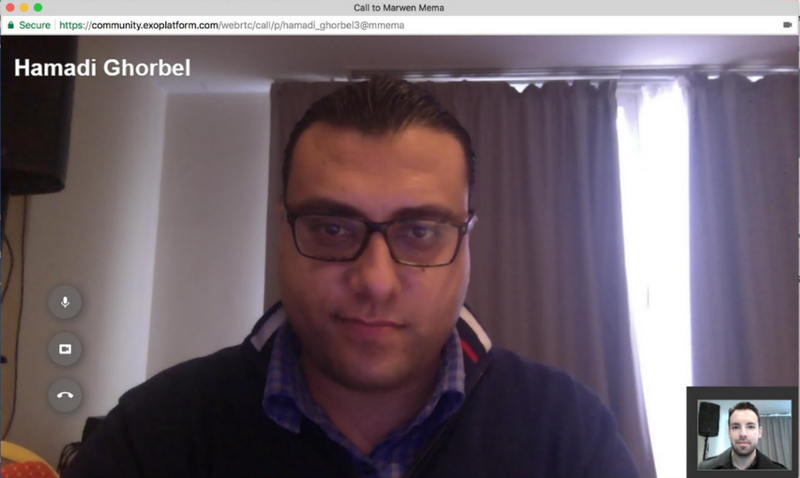 Click –> Web Conferencing on the top navigation bar. To add a server for the WebRTC provider, you should click on button and, a form WebRTC Settings appears. Click on the button to add an ICE server URL. It could be STUN or TURN type. The user can add credentials for the ICE server depending on the server setup. There are public STUN and TURN servers which can be used by any user. In fact the Web Conferencing add-on comes with a default STUN server. In production environments, it is highly recommended to use a dedicated ICE server which is not the default one,as it produces warnings in the platform logs. “peer-to-peer” connectivity, but this will not work well accross networks. optionally secured with credentials. The ICE protocol will use this list of servers to help with WebRTC peers connectivity.